Shoulder pain is a common condition—whether due to aging, overuse, trauma or a sports injury. Shoulder pain and injuries alone account for nearly 20 percent of visits to the doctor’s office. When the shoulder pain interferes with carrying groceries, participating in your favorite activities or getting a good night’s sleep, it’s time to seek medical advice. The rotator cuff is a frequent cause of shoulder pain. Rotator cuff tendonitis is inflammation of the rotator cuff—without a tear of the tendon. 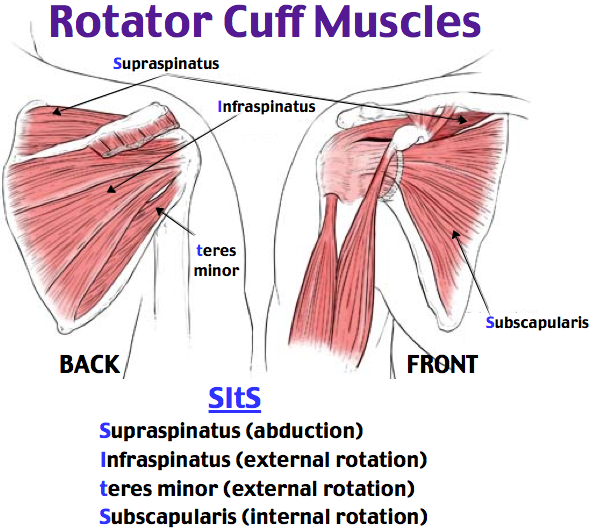 The rotator cuff muscles are active especially in activities above shoulder height. These muscles provide the power to effectively function overhead. Rotator cuff tendonitis leads to pain and dysfunction. Rotator cuff tendonitis is an inflammation of the rotator cuff tendons—without a rotator cuff tear. Patients with rotator cuff tendonitis often report pain. The pain may be activity related—particularly with overhead activity. Pain with rotator cuff tendonitis is often worse at night. Some studies have suggested this association is because the pain receptors in the shoulder are sensitive to pressure—with these receptors sensing more pressure with patients lying horizontal to sleep, as opposed to upright during the day. Patients also complain of dysfunction. Many will have difficulty with overhead activities such as changing a lightbulb or reaching into a shelf to get a glass. Complex overhead activities such as throwing a ball may be difficult or impossible. However, activities below the shoulder, such as hitting a golf ball, may continue to be performed—perhaps with less effectiveness. After reviewing the patient’s symptoms, a review of their pertinent medical history and family history is obtained. The range of motion of the shoulder is measured in multiple planes. The strength of the shoulder in resisting motions is tested. The neck is examined to determine if any overlying nerve impingement may be causing shoulder pain and dysfunction. X-rays of the shoulder are typically utilized for evaluation. Although x-rays do not image the soft tissue of the rotator cuff, they can add information regarding the presence of arthritis, fracture or dislocation. Advanced imaging such as MRI allows accurate representation of the rotator cuff. Patients with impingement syndrome (rotator cuff tendonitis) do not have a torn rotator cuff, but may demonstrate changes in the rotator cuff on MRI studies indicative of tendonitis. Nonoperative treatment is often successful in alleviating issues with rotator cuff tendonitis. pain and function can be improved for many individuals without surgery. First line treatment includes the utilization of anti-inflammatory medications (Advil, Aleve). Tylenol may help patient with pain and may be utilized concurrently. For many patients, heat is a useful adjuvant to improve pain. A steroid injection of the shoulder joint (subacromial space) is often be indicated. These injections may be done in connection with mediations listed above. Exercise has proven a helpful adjuvant for rotator cuff tendonitis. Exercise programs can be performed at home or under the direction of a physical therapist–Both methods appear equally effective in studies, with some studies showing better results with home therapy. Risks with injection include depigmentation, tendon rupture, and infection. A combination of steroid injection, medication, and therapy typically results in resolution in approximately 80% of cases. Patients who continue to have pain in spite of treatment next step is usually advanced imaging—typically MRI. In patients found to have a rotator cuff tear, surgery to address the rotator cuff tear arthroscopically is the next most common step. The acromion forms the roof of the rotator cuff space (subacromial space). As patients age the inferior aspect of this area enlarges—decreasing the space for the rotator cuff tendons. Patients who have shoulder impingement and negative advanced imaging studies (e.g. no tears of the rotator cuff on MRI), are candidates for arthroscopic management. Shoulder arthroscopy for impingement makes the space where the rotator cuff tendons contract larger by shaving “bone spurs” from the inferior aspect of the acromion. This relieves the pressure on the rotator cuff and relieves the pain associated with rotator cuff tendonitis. Shoulder arthroscopy diagram on right showing removal of bone spurs. 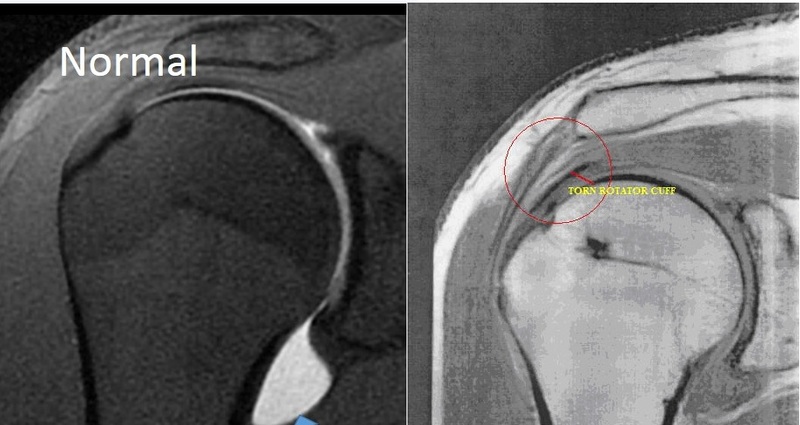 Image on left shows worsening of tendonitis with patients arms at shoulder height and above. 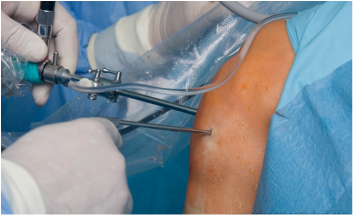 Arthroscopic subacromial decompression is typically performed as an outpatient surgery. The surgery is typically performed under a regional block and may be accompanied by sedation or general anesthesia. Arthroscopy is performed through poke holes in the shoulder typically no larger in diameter than a pen. Typically only 2 poke holes (portals) are required for arthroscopic shoulder decompression. Slings are utilized after surgery only for comfort and early motion is encouraged. Patients are typically seen in about 10 days after surgery for suture removal. Many studies have shown that patients can successfully rehabilitate their shoulder on their own at home. Patients are typically guided through a therapy program and weaned from their sling. Therapy is geared toward restoration of strength and motion. Most patients have experienced excellent pain improvement over the first 2-6 week after surgery. Continued work on motion and strength allows for additional improvement.